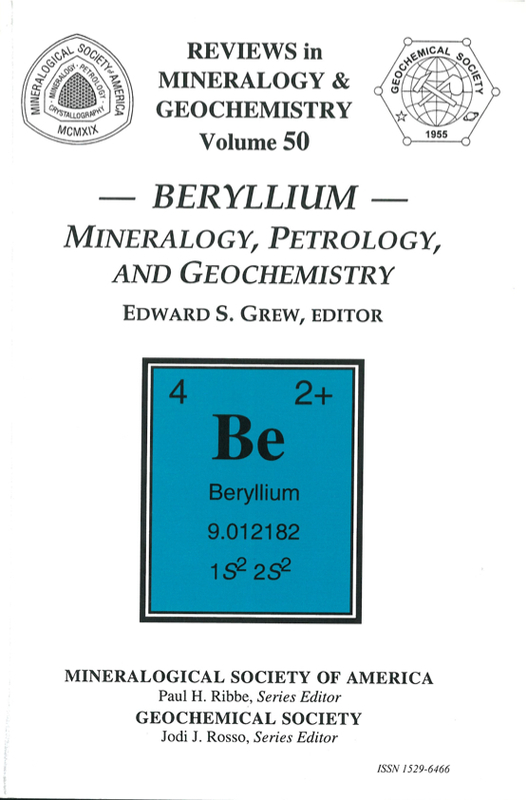 This book has been several years in the making, under the experienced and careful oversight of Ed Grew (University of Maine), who edited (with Larry Anovitz) a similar, even larger volume in 1996: Boron: Mineralogy, Petrology, and Geochemistry (RiMG Vol. 33, reprinted with updates and corrections, 2002). Many of the same reasons for inviting investigators to contribute to a volume on B apply equally to a volume on Be. Like B, Be poses analytical difficulties, and it has been neglected in many studies. However, with recent improvements in analytical technology, interest in Be and its cosmogenic isotopes has increased greatly. 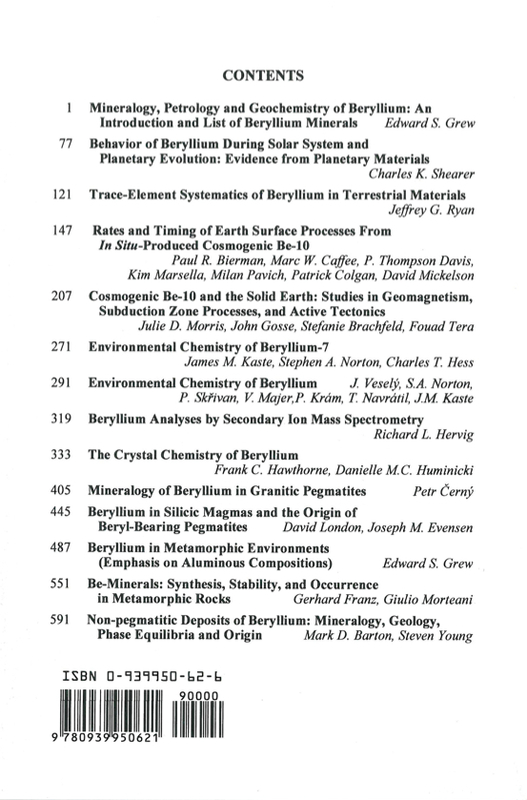 Chapter 1 (Grew) is an overview of Be studies in the earth sciences backed by an extensive reference list, and an annotated list of the 110 mineral species reported to contain essential Be as of 2002, together with commentary on their status. A systematic classification of Be minerals based on their crystal structure is presented in Chapter 9 (Hawthorne and Huminicki), while analysis of these minerals by the secondary ion mass spectroscopy is the subject of Chapter 8 (Hervig). Chapter 13 (Franz and Morteani) reviews experimental studies of systems involving Be. Chapter 2 (Shearer) reviews the behavior of Be in the Solar System, with an emphasis on meteorites, the Moon and Mars, and the implications of this behavior for the evolution of the solar system. Chapter 3 (Ryan) is an overview of the terrestrial geochemistry of Be, and Chapter 7 (Vesely, Norton, Skrivan, Majer, Kr·m, Navr·til, and Kaste) discusses the contamination of the environment by this anthropogenic toxin. The cosmogenic isotopes Be-7 and Be-10 have found increasing applications in the Earth sciences. Chapter 4 (Bierman, Caffee, Davis, Marsella, Pavich, Colgan and Mickelson) reports use of the longer lived Be-10 to assess erosion rates and other surficial processes, while Chapter 5 (Morris, Gosse, Brachfeld and Tera) considers how this isotope can yield independent temporal records of geomagnetic field variations for comparison with records obtained by measuring natural remnant magnetization, be a chemical tracer for processes in convergent margins, and can date events in Cenozoic tectonics. Chapter 6 (Kaste, Norton and Hess) reviews applications of the shorter lived isotope Be-7 in environmental studies. Beryllium is a lithophile element concentrated in the residual phases of magmatic systems. Residual phases include acidic plutonic and volcanic rocks, whose geochemistry and evolution are covered, respectively, in Chapters 11 (London and Evensen) and 14 (Barton and Young), while granitic pegmatites, which are well-known for their remarkable, if localized, Be enrichments and a wide variety of Be mineral assemblages, are reviewed in Chapter 10 (Cerny). Not all Be concentrations have obvious magmatic affinities; for example, one class of emerald deposits results from Be being introduced by heated brines (Chapters 13; 14). Pelitic rocks are an important reservoir of Be in the Earth's crust and their metamorphism plays a critical role in recycling of Be in subduction zones (Chapter 3), eventually, anatectic processes complete the cycle, providing a source of Be for granitic rocks (Chapters 11 and 12).